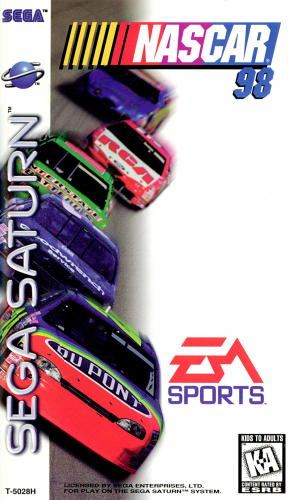 NASCAR '98 offers 10 real tracks (and 16 overall) and 24 drivers, helping put you right in the middle of all the action. On top of the healthy selection of tracks and drivers, you also get all the real sponsors, so you'll feel like you're watching a race on television rather than playing on your Sega Saturn. Even further enhancing the TV-style presentation are the multiple camera angles that perfectly mimic those you see on ESPN. The soundtrack of the game features pounding beats that will get your blood flowing and your adrenaline pumping as you race around the track at speeds in excess of 200 mph.